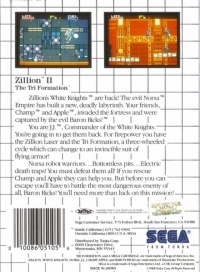 Box Text: Zillion's White Knights are back! The evil Norsa Empire has built a new, deadly labyrinth. Your friends, Champ and Apple, invaded the fortress and were captured by the evil Baron Ricks! You are J.J., Commander of the White Knights. You're going in to get them back. For firepower you have the Zillion Laser and the Tri Formation, a three-wheeled cycle which can change into an invincible suit of flying armor! Norsa robot warriors...Bottomless pits...Electric death traps! You must defeat them all! If you rescue Champ and Apple they can help you. But before you can escape you'll have to battle the most dangerous enemy of all, Baron Ricks! You'll need more than luck on this mission! 01-31-2016 Flashback2012 Box Text Zillion's White Knights are back! The evil Norsa Empire has built a new, deadly labyrinth. Your friends, Champ and Apple, invaded the fortress and were captured by the evil Baron Ricks! You are J.J., Commander of the White Knights. You're going in to get them back. For firepower you have the Zillion Laser and the Tri Formation, a three-wheeled cycle which can change into an invincible suit of flying armor! Norsa robot warriors...Bottomless pits...Electric death traps! You must defeat them all! If you rescue Champ and Apple they can help you. But before you can escape you'll have to battle the most dangerous enemy of all, Baron Ricks! You'll need more than luck on this mission! 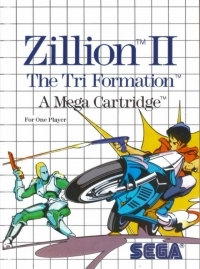 This is a list of VGCollect users who have Zillion II: The Tri Formation in their Collection. This is a list of VGCollect users who have Zillion II: The Tri Formation in their Sell List. This is a list of VGCollect users who have Zillion II: The Tri Formation in their Wish List.